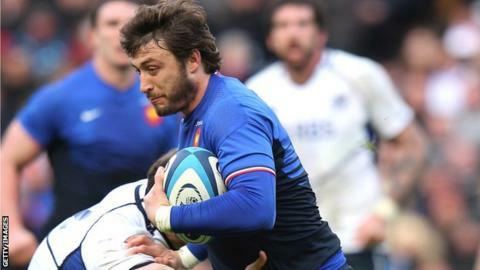 France have recalled full-back Maxime Medard to their match-day 23 in one of two changes for the Six Nations clash with Ireland in Dublin on 9 March. Medard made his comeback in November after tearing knee ligaments against Scotland in last year's championship. The Toulouse flier could start at full-back with Yoann Huget moving to the wing after Benjamin Fall was dropped. The other change comes in the pack with Perpignan lock Sebastien Vahaamahina replacing Jocelino Suta. Vahaamahina, 21, won his only cap to date as a replacement against Australia in November. France have lost their first three championship games for the first time since 1982. They were beaten 23-18 by Italy in their opening match before losing 16-6 at home to defending champions Wales and slumping to a 23-13 defeat against England at Twickenham on Saturday. "We have made those two changes so we can prepare for the last two games (against Ireland and Scotland) on the basis of our match against England," said coach Philippe Saint-Andre. "We were better collectively at Twickenham. Maxime has shown that after his injury he is back to his best level. "Sebastien played in November with France and he has been performing very well with his club." Backs: Maxime Machenaud, Morgan Parra, Frederic Michalak, Francois Trinh-Duc, Mathieu Bastareaud, Vincent Clerc, Wesley Fofana, Florian Fritz, Yoann Huget, Maxime Medard. Forwards: Vincent Debaty, Thomas Domingo, Benjamin Kayser, Dimitri Szarzewski, Luc Ducalcon, Nicolas Mas, Yoann Maestri, Christophe Samson, Antonie Claassen, Thierry Dusautoir (captain), Yannick Nyanga, Louis Picamoles, Sebastien Vahaamahina.